This entry was posted in Born 'on the cusp'? and tagged Ascendant, Astrological sign, British Summer Time, Gemini, Glasgow, Planets in astrology, Sun, Zodiac. Bookmark the permalink. ” What is the Saturn Return”? it sounds very interesting and I’d like to know more. many thanks for your question which is a really good one because the Saturn Return is a very important topic in astrology. I’ll leave our readers with bated breath waiting for an answer and get back to it in the next day or two! I have temporarily worn out my braincell on the Cusps issue…. Thank you so much, Anne. Your very eloquent explanation resurfaced a memory of my first husband who was an identical twin. They looked alike, had the same mannerisms and interests, but their personalities were as different as night and day. Glad you found this useful and evocative, Rian. Funnily enough, I was thinking about twins born five minutes apart and how different their lives can be as I was writing the post. Now there’s a topic – twins – just dying to have a question asked about it! Ok, twins!! Two babies and two questions. Do you think there is any difference astrologically between identical twins compared to non identical twins. And considering a lot of twins are now born by c-section therefore their arrival times are separated by a very few minutes, does that means twins are astrologically more similar nowadays. Previously they would have been born naturally and the birth times could have been separated by many minutes or hours. Yes, Sheilagh, I knew someone was bound to respond to the question dying to be asked. Not surprised it is you! Will return to this one later; off out to enjoy that fabulously unusual, mirage-like event going on outside: warmth and sunshine AT THE SAME TIME in the city of Glasgow…. Yes, the “cusp” is a very interesting topic for astrologers. And one that many astrologers disagree on. Personally, I do recognise a cusp. Why? Does summer immediately collapse into winter? No, there is Autumn, or Fall, inbetween as one energy takes over from the other, and blends into the other. Nature shows the way. Another way to recognise the cusp is to notice how we are rapidly progressing from the age of Pisces into the age of Aquarius. We are rapidly replacing the fish of Pisces (and Christianity) with the “wave” form of Aquarius, as the truth (and thereby liberation) is poured out from the water carrier’s urn for all to partake in. Plenty of microwaves, short waves, UHF waves, FM waves, and so on, as Uranus’ function as the higher communicator grows stronger and stronger. And of course, plenty of exciting new inventions, and we are only ‘on the cusp’ of what is to come in that area. Instead of going to the Piscean priest for the truth, we now look it up on Google and the internet – on a platform where everyone is equal. The truth is setting us free. Yes, the topic of cusps is a big one upon which one could spend a great deal of time. 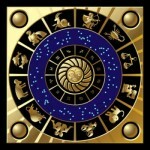 The challenge for me here is pitching my answers so that there are some clear guidelines for visitors and enquirers new to astrology, not going into too much complexity – but at the same time offering something to seasoned practitioners. This is where contributions from other astrologers are so helpful: putting some meat on the bare bones, so to speak, and giving newer students glimpses of the Bigger Picture. So many thanks for dropping by my new venture! I agree very much with what you say. One of the most fascinating current contexts for me as for many astrologers is the current ‘cusp’ state we are in regarding the shift of World Ages. Your insighttful observations are most welcome. Thank you Anne. I like your new blog. You are getting into some interesting territory and addressing some interesting questions. Good to hear from you again, Wizron. We just keep rolling along…. Interesting that one of the very few bits of astrological “knowledge” I’ve had concerns cusps. I was born October 23, and was told as a child I was on the cusp between Libra and Scorpio. Of course, all that meant for me then was that I could choose between the daily predictions in the newspaper. If Scorpio didn’t suit me, I’d go with Libra, and vice-versa! Of course I’ve figured out since finding your blog that such an approach is, shall we say, simplistic. But now I have a better understanding of the term! Hello Linda. We are in tune today – I’ve just sent off an email to you at the precise moment your comment came in. I wonder what an astrologer would make of that, then?! and thought well – now you know, probably in more detail than you might ideally wish! Glad it has clarified things for you. Thanks so much for Following. Why is Virgo called the virgin? thanks for this question which raises the interesting issue of how the usage and meaning of words changes from one phase of culture to another. I will return to answer it when I have some time, in the next day or two. As I have just said, this question raises the interesting issue of how the usage and meaning of words changes from one historical period/cultural phase to another. Within our current culture the word virgin when applied to humans generally means sexually intact. However, in ancient times when matriarchal religions were practised, the word virgin and the astrological sign of Virgo held a deeper and more complex set of meanings. Thanks for your stimulating question! My son is born in Ålesund, Norway 21st of June 2013. I’ve been trying to figure out if he’s a gemini or cancer, but with no luck. Can You help me? He is born in The day, 1:53 pm. I have put your question and my answer up on my Facebook Page since I think other readers might be interested – along with his chart. 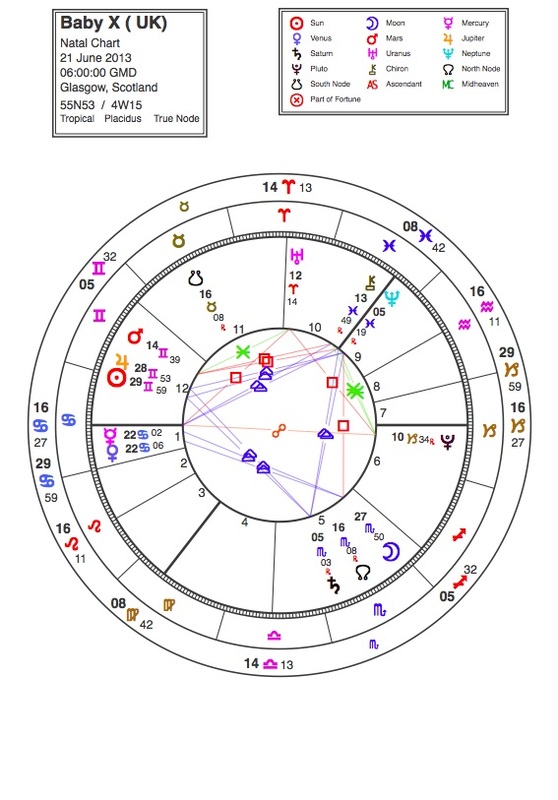 He is a Sun Cancer as you will see from the chart. Thanks for dropping by – and enjoy bringing up this restless, adventurous young seeker after wisdom and truth! As human beings we have a habit of setting up boundaries and limits and dividing things into departments, but perhaps you could see your son as being made up of both signs Elise, rather than one or the other. I happen to know a few Gemini-Cancer cusp people, and I recognise the character traits that these people have in common, so perhaps I can share that knowledge with you. Gemini makes him very curious and a natural communicator and “talker”. Cancer makes him a storyteller, so expect him to talk a LOT, and FAST, as he shares his thoughts and tries to get all his emotions out into words. He has a strong and quick intellectual side (Gemini), and he has a deeply emotional side (Cancer), and these two sides of his nature (which are quite different from each other) will become more obvious as he grows older. You are most welcome, Elise! I felt it would be nice for you just to have a brief positive comment on your lively, interesting child. Another astrologer also left a comment, which I left on because it was constructive and illuminating. And thanks for Liking my Page!